It’s a popular belief that breakfast is the most important meal in a day. Scientists say breakfast prepares the human body to do activities after a long “fast” in the night. Even some studies linked breakfast to higher scores in school and better performance in work. Furthermore, breakfast is also linked to a habit of healthy people, some studies stated that people who eat breakfast regularly have lower chances of getting diabetes and heart disease. That belief is something global, breakfast has become the main part of culture and tradition around the world. Different part of the world has different preferences on what they eat as breakfast. A savory, sweet, light or heavy meal, and all the range of food people eat for breakfast are heavily based on the culture they grow up with. Modern days also shape the culture of eating breakfast. A busy schedule is the main reason people don’t eat breakfast in the morning nowadays. With communication technology that decreases the global distance between people around the world, it’s so easy to adapt and change our breakfast habit from another culture that we think it’s better and healthier. Russian families usually have breakfast early in the morning. They have a generation to generation porridge recipe called Kasha. Kasha is like the original version of cereal that commonly we eat with milk today. It’s made from grains from cerealia plants, usually buckwheat. Kasha is Russian’s national dish that can come in many flavors, savory with salt or sweet with sugar. The liquid base can be milk or water with butter. It also can be served as a main dish or side dish. This kasha is rich in fiber, fat, protein, and carbohydrate, a pack of great nutrients to start a day. Fiber is also a substance that helps your digestive system work smoothly, freeing you from the constipation problem. Your pet, especially dogs can also have a constipation problem that you need to treat immediately. Russians really love porridge. It is really common to feed kids in Russian families with many kinds of porridge. Semolina is flour made from durum wheat. It has two kinds of color, white and yellow. The yellow one is usually used for pasta ingredient meanwhile, the white one is used for semolina porridge. The texture of this flour is more granulated than the common wheat flour. This porridge is made with mixing semolina to boiling milk. It only takes nearly 10 minutes to make this dish, really suitable for breakfast that needs to be done quickly. If you have dogs and you usually let them taste your food or lick your plates then be cautious if your dogs have food allergies. This dish is rich with savory and sweet tastes that lingers in your mouth. Foreigners often state Syrniki as their favorite dessert, but actually this dish can be served for breakfast too. The main ingredient of Syrniki is cottage cheese. Homemade cottage cheese in Russia is often called Tvorog. Making Syrniki from homemade cottage cheese or store-bought is depend on preferences, but the quality of the cottage cheese will really affect the taste. Other than cottage cheese, Syrniki’s dough consists eggs, flour, and sugar. The dough is usually cut into small slices then deep-fried until golden brown. For anyone who is interested in making Syrniki but can’t find cottage cheese at your place, you can use cream cheese instead. This breakfast will lift your mood up, make you ready to start the day. It’s really hard to resist enjoying the delicious Syrniki. Don’t forget to make sure your pets enjoy their meal too, you should pay attention if your hamsters lose their appetites. Pancake is a breakfast that has been approved by people in any part of the world. Simple but delicious. Moreover, you can be creative with adding any kind of ingredients for the batter and any topping that you like. This sweet dish has its traditional version in Russia called Bliny. Bliny is ancient food that comes from pagan times when people still worship the sun. Could you guess the correlation between pancakes and the sun? Yes, they have a similar shape. Every Russian family has its favorite variation of Bliny. One of the most popular and traditional version is adding kefir to the batter, but nowadays with the influence from the internet, Bliny is not so different from a modern pancake. Don’t forget to take care of your teeth after eating sweet dishes. Brushing teeth regularly after breakfast is the key to healthy and beautiful teeth. Also take care of your dog’s teeth too, since they can’t brush them on their own. Russian foods originally have many similarities with European foods. Both Russian and European really love pieces of bread! One of the most popular bread is a baguette. A big piece of bread made from sour-dough that often baked in a traditional oven. Baguette can be eaten in many ways, Russian has its own way with frying it in egg mixture and called it Grenki. This sweet dish is also a good solution to a baguette that is going stale. Internationally, we usually called this dish with French toast. Any topping can complete this delicious dish, from powdered sugar, honey, until berries. The appropriate drink to accompany this dish is coffee or tea. Grenki is a really wonderful breakfast for children, make them energized to go to school. Make sure not only your kids that taken care of, but also your baby hamsters that need to be fed. 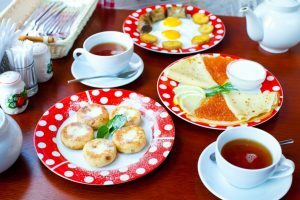 Here are the answers to your curiosity about what Russian people eat for their daily breakfast! You can also make these wonderful dishes with recipes from the internet to make your breakfast more colorful and give an additional boost for yourself to start the days.